Below the Line refers to items in a profit and loss accountProfit and Loss Statement (P&L)A profit and loss statement (P&L) is a financial report that provides a summary of a company's revenues, expenses, and profits/losses over a period of time that show no noticeable effect on a company’s revenueSales RevenueSales revenue is the starting point of the income statement. Sales or revenue is the money earned from the company providing its goods or services, income for the year. It is an unofficial term used by people who deal with below and above the line expenses regularly. It includes exceptional and extraordinary items that are relevant to another accounting periodFiscal Year (FY)A fiscal year (FY) is a 12 month or 52 week period of time used by governments and businesses for accounting purposes to formulate annual financial reports. A Fiscal Year (FY) that does not necessarily follow the calendar year. It may be a period such as October 1, 2009 – September 30, 2010. or do not apply to the current accounting period. These items may be included in subsequent accounting periods when they become relevant. Categorizing certain items in the financial statements as below the line aims to depict the actual financial position of a company. An item is listed on the financial statement as below the line when it is excluded from the income statement, and, therefore, does not affect the profit or loss account for that accounting period. For example, a company may earn a substantial non-recurring revenue in an accounting period that does not relate to the company’s ordinary course of business. Also, the company may incur a large non-recurring cost that does not reflect the usual expenses incurred by the company. Excluding these items helps reveal the real financial health of the company without artificially inflating or understating the revenues for the accounting period. For example, a company that is in the business of manufacturing and selling water pumps to wholesalers may decide to dispose of one of its manufacturing plants. The company may sell the plant because it is underutilized, or the company is facing financial difficulties. The company will receive a large non-recurring income after selling the plant that may portray the company as financially healthy even if it is undergoing financial distress. Such an income should be excluded in the income statement but should be added to income after regular operations are completed. In the example above, we demonstrate the concept of below the line expenses or income. The line is generally seen as net income, and any items below the line are items that would otherwise not affect any financially reported income. 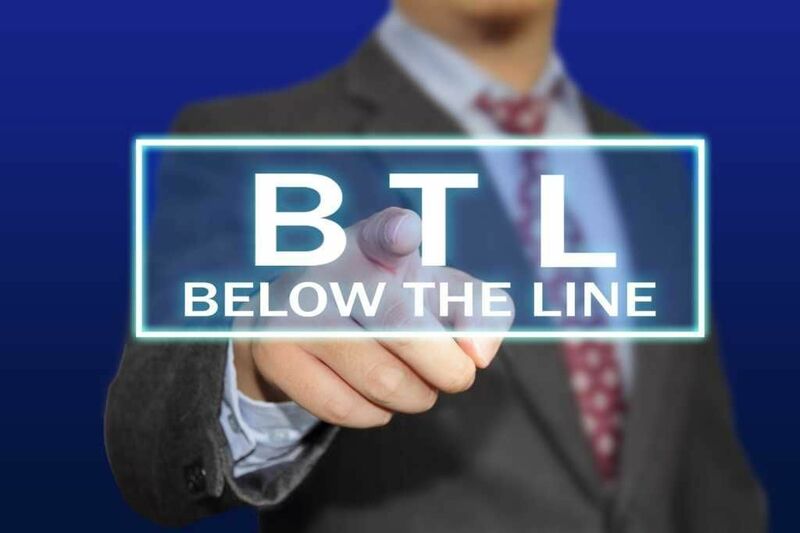 The term “below the line,” however, is very loosely defined and some people may consider “Gross Profit” to be the line. In such cases, below the line expenses means all expenditures that do not affect gross profit, but will affect net income. Exceptional items are charges that are part of the ordinary business expenses that must be disclosed due to their large size or frequency. 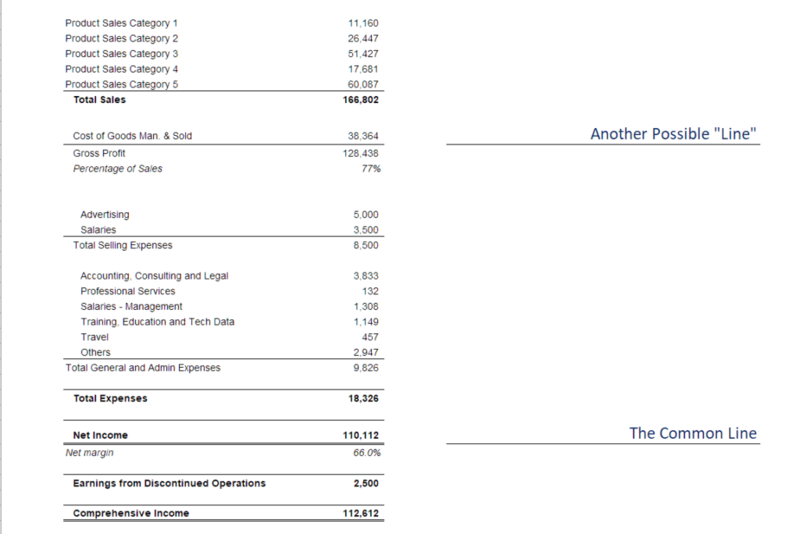 GAAP requires these items to be noted on the company’s balance sheet for the year. Due to their material nature, exceptional items must be disclosed so that regulators and stakeholders know the actual financial standing of the company. Exceptional items differ from extraordinary items in that the latter is not part of the ordinary business dealings. Extraordinary items comprise gains or losses that result from events that are infrequent and unusual. They are not expected to reoccur in the future and must, therefore, be separated from the ordinary operating expenses or incomes. These items must be explained in the notes to the financial statements. For an event to be classified as extraordinary, it must be unusual and infrequent. An unusual event is one that is abnormal and unrelated to the ordinary operating activities of the reporting company. An infrequent event is one that does not occur regularly and is not expected to reoccur in future accounting periods. Before 2015, companies focused on determining if an event should be reported as extraordinary for tax purposes. The gains and losses from extraordinary events after taxes had to be distinguished from the incomes and losses from ordinary operating activities. In January 2015, the GAAP principles were changed, scrapping the concept of extraordinary items. It eased the preparation of financial statements since accountants were no longer required to distinguish the extraordinary items. The update also eliminated the need for auditors and regulators to assess if extraordinary items had been identified and classified as required by GAAP. The change, however, still requires companies to report and disclose unusual and infrequent transactions and their effect before taxes. Some below the line items present companies with an opportunity to manipulate its profitability so that it appears more or less profitable than it is. For example, a company can dispose of one of its assets for a much higher value and use the excess funds to offset an operating loss on the income statement. By taking such an action, the company’s objective is to appear more profitable to investors and regulators than it actually is. Also, a company may categorize some of the above the line expenses in the income statement as below the line items, as a way to convince investors that the company is financially stable. If the investors realize that the company is not performing as reported in the accounting books, the company may be investigated by regulators. An example of a company that practiced creative accounting is Lehman Brothers. The company temporarily moved liabilities off its balance sheet with the aim of selling them although they planned to buy them back immediately. Above the line items refer to incomes and expenses that relate to the normal operations of a company. Unlike the below the line items, these items count when calculating the profit earned or loss incurred during an accounting period. The profit is calculated by deducting the usual expenses for the year from the revenue. If the revenues exceed the costs, the company is deemed to have made a profit. However, if the costs exceed the revenue, the company is considered to have incurred a loss during that accounting period. Above the line may also refer to the gross margin earned by the business. The gross margin is calculated by taking the revenues for the year and deducting the Cost of Goods Sold (COGS)Cost of Goods Sold (COGS)Cost of Goods Sold (COGS) measures the “direct cost” incurred in the production of any goods or services. It includes material cost, direct labor cost, and direct factory overheads, and is directly proportional to revenue. As revenue increases, more resources are required to produce the goods or service. COGS is often. The COGS are the expenses incurred in the normal operations of the business to generate the revenues. They may include the cost of raw materials, wages of workers in the manufacturing line, and other manufacturing overheads. The items below the gross profit are the below the line items that include other operating expenses like operating expenses, taxes, interests and other extraordinary expenses. Thank you for reading CFI’s guide to below the line expenses/income. To continue advancing your financial education, see the following resources. Financial Modeling and Valuation Analyst GuideFMVA™ CertificationThe Financial Modeling & Valueation Analyst (FMVA)™ accreditation is a global standard for financial analysts that covers finance, accounting, financial modeling, valuation, budgeting, forecasting, presentations, and strategy.